As usual, I’ve been a busy guy. Some highlights from the past week include a great meal at Vios, a fun trip to Boston for my folks 60th birthdays, and an excellent concert at The Showbox (Beth Orton and Willy Mason). 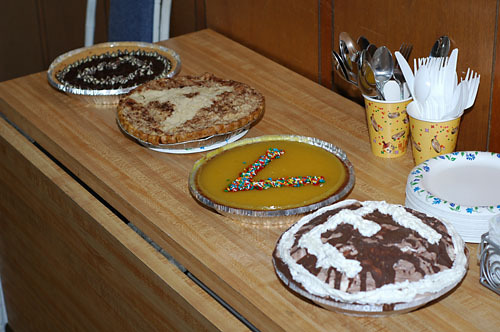 And, to top it off, the ‘D’ is double chocolate, the ‘A’ is apple, the ‘V’ is vanilla pudding, and the ‘E’ is eskimo pie. Very impressive! Spring has sprung here in Seattle, and I’ve already started taking advantage of the beautiful weather. Frisbee started yesterday – though we didn’t win, it’s great to be playing with the Rain Dogs folks again. Somehow, I thought it wouldn’t be too detrimental to play disc before participating in the Big Climb (a fundraiser for leukemia research). Turns out climbing 70 stories really is a lot of work, and playing ultimate for two hours beforehand probably didn’t help my time. That said, I did meet my goal of completing the climb in under 15 minutes (results are here). After all the physical exertion, I watched a couple of movies this weekend. Recommended is Me and You and Everyone We Know – a great, self-contained movie about quirky folks (and contemporary art). Not really recommended is Thumbsucker. Surprisingly, it wasn’t Keanu that ruined the movie – the not-so-great acting and mediocre writing took care of that. Yesterday was, among other things, Pi Day and my birthday. The Pi(e) Party on Saturday was a great time – thanks to Matt for the pictures and Jared & Chika for hosting. I don’t usually expect my birthday to be much different from any other day, but yesterday was a very pleasant exception. I got a slew of messages (email & phone) from friends and family, both local and back on the East Coast, wishing me well, had a good day at work, and an excellent dinner with my brother and a couple friends at the Dahlia Lounge. It was a great day. I don’t often make New Year’s resolutions, but I sort of made one this year – I wanted to finish some projects that’ve been going on forever, notably, the robot arm (3 and a half years and counting) and a sweater (7 years plus). It was a lofty goal, but at first I thought I could get the robot arm up and running in time for my birthday. In the last 3 months, I’ve made a ton of progress, but it won’t be ready for the party this Saturday. Though it was before I was born, my parents tell of when there was a groundhog nosing around the garden in Sharon and eating the plants. My grandfather shot it, and my grandmother, not wanting to be wasteful, made a stew out of it and made everyone eat it. Not so sad I wasn’t around for that one. Anyone wanting to be more depressed about the Bust administration and the inhumane treatment of foreign detainees should take a look at this New Yorker article. Actually, pretty much everyone ought to read it. You can also listen to an interview with the author of the article here.